Homemade Frozen Pizzas are easy to make. Stock up your freezer with a quick meal full of homemade goodness. It’s better than take-out! Homemade frozen pizzas only take a small amount of time to put together for large quantities of pizza on hand in the freezer at all times. It’s the perfect freezer meal that the whole family will love. How long do these pizzas take to put together? It takes approximately 8 minutes to make the dough and get it rising. It will need to rise for 90 minutes to 2 hours. After that it will take approximately 15 minutes to roll out and top 3 pizzas. This brings your total “hands on” time to just 23 minutes. You can’t even get a pizza delivered in 23 minutes! Absolutely! Doubling it can be done if you have a heavy duty, large capacity stand mixer. If you don’t, you can simply make two batches back to back and have them rise in separate bowls. A professional series Kitchen Aid stand mixer can handle a double batch, while their Artisan series is best suited to a single batch. These Homemade Frozen Pizzas will stay good in the freezer for up to 3 months if wrapped well in plastic wrap to prevent freezer burn. 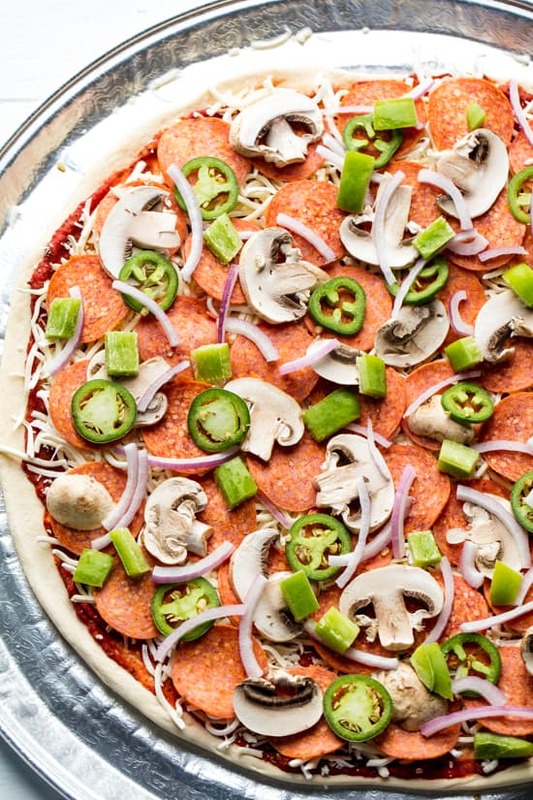 Can I do this with other toppings than just pepperoni? Yes, any topping that is freezable will work just fine. I even make a cilantro-lime chicken pizza that freezes quite well. What kind of tray do I freeze these on? You can either use clean cardboard cut into 16 inch circles, or aluminum pizza trays. I purchased my pizza trays from a restaurant supply store. What if I have a side by side refrigerator/freezer? Well then, a large 16 inch circular pizza like this just won’t fit. Make it into a large rectangle instead and use a different kind of tray. Shape doesn’t really matter when it comes to pizza. All that matters is that it is still thin enough that it won’t require par-baking. Do I need to par-bake the crust? No! This recipe does not require any par-baking of the crust. 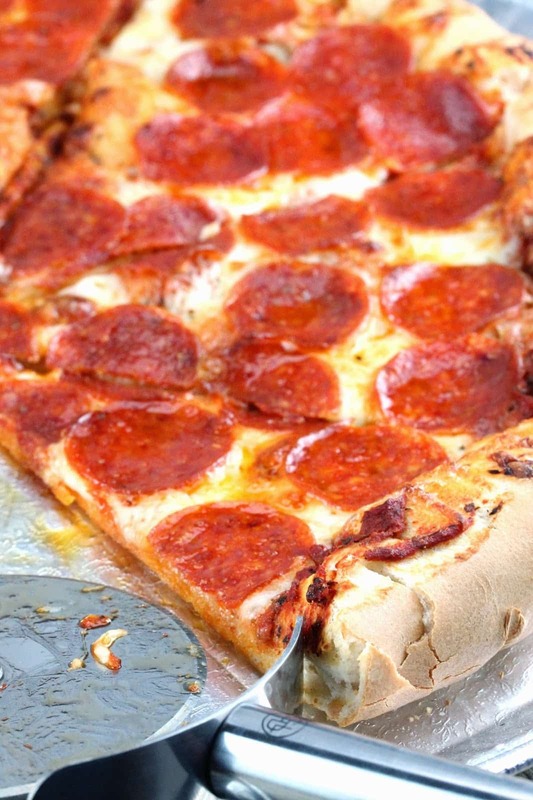 The crust is thin enough that it will thaw and cook completely through at the same rate as the toppings. 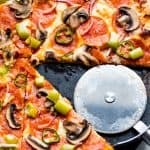 How do I store the pizzas once frozen? Pizzas should be wrapped in plastic wrap for longer term storage. They can stay in the freezer on trays for 5 to 7 days without getting freezer burn, but should be wrapped or otherwise prevented from being exposed to the freezer air for longer term storage. Watch the video below for a demonstration on how I make these pizzas including several great tips and tricks for best results. It should answer any other questions you might have. Homemade Frozen Pizzas are easy to make. Stock up your freezer with a quick meal full of homemade goodness. It's better than take-out! In the bowl of a stand mixer, combine yeast, brown sugar, salt, water, and flour. Knead on low until dough starts to come together. Continue kneading until the dough forms a nice, soft dough ball and the sides of the bowl are clean. Let rise in a lightly greased bowl, covered, for 1 to 2 hours, until doubled. Divide the dough into three equal pieces and roll out into pizza crusts. Place crust on a tray for freezing. Top with desired sauce, cheese, and other toppings. Once solid, wrap with plastic wrap and store in the freezer. Pizzas stay good for 1 to 3 months. To bake, preheat a pizza stone in the oven at 500 degrees. Bake until cheese is browning and bubbly, about 10 to 15 minutes. 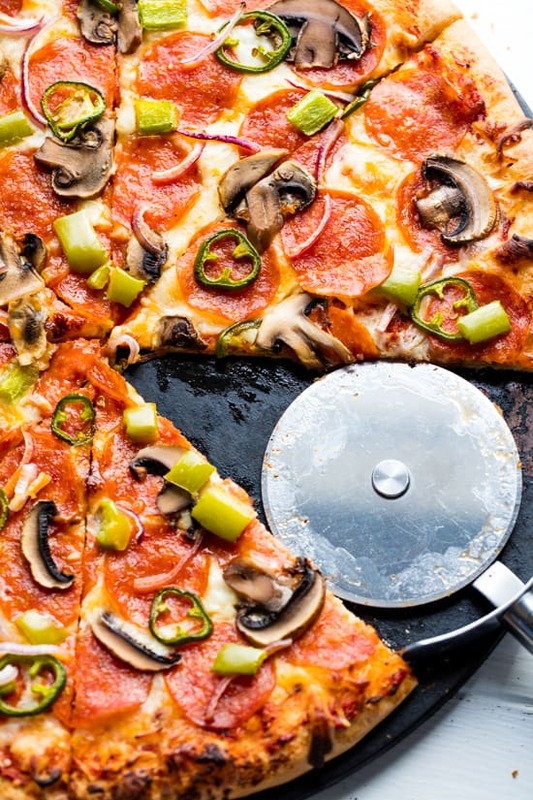 If you do not have a pizza stone, try using a cast iron skillet. Great results. How do you make this a stuffed crust pizza? Just put some cheese around the edges and roll the crust around it and pinch the dough together. Bam! Stuffed crust! I really want to make this. However, I do not have instant yeast. I have active dry yeast. How should I alter the recipe? Thanks and looking forward to making this! Add the yeast to the warm water and let it proof for 10 minutes before proceeding in the recipe.